I think we all have a tendency to get caught up in searching out the knobs, barrels, patches, etc. and forget to look back at why most of us are in this hobby to begin with: To relive the memories of our childhood. 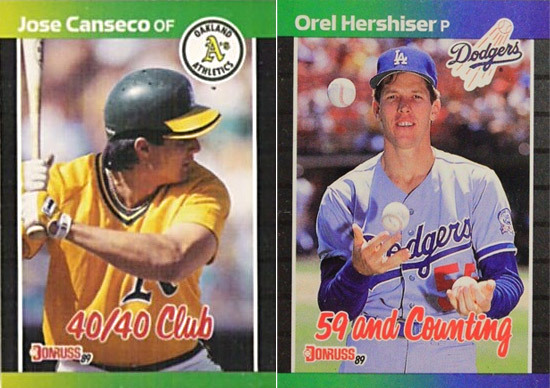 These two were singled out of my beloved 1989 Donruss set for having the cool cursive font on the front. On one side of the spectrum, it shows baseball’s bad boy who, at the time, was the best player on the planet. On the other side, is the baseball saint who sang a church hymn on a talk show. One with brute strength, and one with dominant stuff (at least for a time) – yet thin as a rail. I remember Tommy Lasorda laughing at people calling Hershiser a Bulldog, and said he is more like a Bullfrog. Whatever he was, that Bullfrog dominated my Oakland A’s in 1988 and I always had a love-hate feeling toward him because of it. Regardless, these two worthless pieces of cardboard have all kinds of memories wrapped up them for me. What worthless cards are priceless to you? I don’t think Jose was really a “bad boy” till around 1989 when he started having trouble with the law. I’m not sure, what do you think?